Sponge Candy is a favorite of Buffalonians. Travel the country and ask for sponge candy and most folks will not have a clue what you’re talking about. It is in the same genre as toffee and can be found anywhere from Great Britain to Scotland to New Zealand, but in America, the main distributors are in Buffalo, Michigan and other locations around Lake Erie. Fowler’s is another favorite – here is a link to their locations in East Aurora, Hamburg, Buffalo, Cheektowaga, Tonawanda and more. 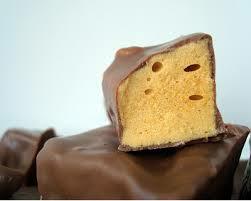 If you’re in the South Buffalo area, stop by Park Edge Sweet Shoppe for some of their famous sponge candy! Watson’s Chocolates has locations in Kenmore, Amherst, Buffalo, Orchard Park and more. All of the shops ship all over the world! There is no better place than Buffalo, NY to get delicious sponge candy!